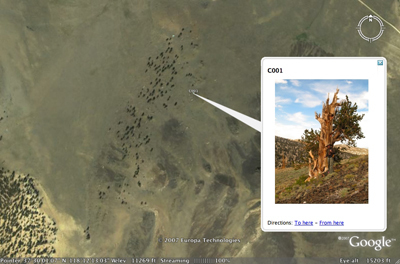 Laura Welcher just pointed me to this Google Earth Outreach project on the ancient Bristlcone Pine tree. These are the same trees that live atop our Nevada Clock site. Much of the data comes from our friends over at the Arizona Tree Ring Lab that have been studying the trees on our property. By studying the rings on living and dead bristlecones they have been able to piece together climate data of the last 10,000 years.